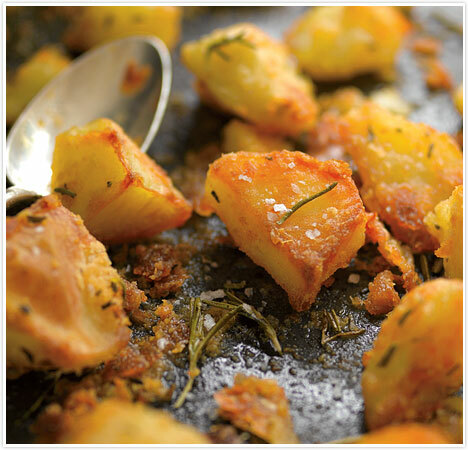 A quick and easy way to make the most perfect roasties for a yummy Sunday lunch, I must admit I adapted this advice after hearing Michael Caine chatting about his recipe on Radio 4 a while ago! Boil the potatoes on the hob for no more than 5mins in boiling salted water, then drain. Coat the potatoes in flour and shake in the pan with the lid on until totally coated. Add Salt and Pepper. Pour a layer of cold oil into a roasting dish, then tip the potatoes in. Spoon the oil over each potato to make sure they are all covered. Sprinkle over some rosemary and a few cloves of squashed garlic with its skin left on. Roast for an hour or until golden, turning and basting every 20-30mins. Gallery | This entry was posted in Recipes / Food and tagged Christmas, Dinner, Food, Potato, Recipe, Roast. Bookmark the permalink.